In this guide we'll set up our Raspberry Pi so that we can stream live video to YouTube to either a public, unlisted or private stream. Using a pre-built Docker image means we know exactly what we're getting and instead of having to go through lots of manual steps we can type in a handful of commands and get started immediately. Acknowledgements: thanks to Richard Gee for giving me the idea to live stream with a Raspberry Pi. Normally this would have involved typing in many manual CLI commands and waiting up to 9 hours for some video encoding software (ffmpeg) to compile itself. If you got anything wrong you'd have to add on another 9 hours of compilation time (on a PiZero). In fact while compiling this tutorial I left my Pi running over night and it ran out of disk space meaning I had to start all over again. You'll need a Raspberry Pi, I've used a Pi Zero here and the accompanying camera cable. Once you've setup the camera according to the official guide you're going to be good to go. You'll now be streaming live to the Internet, so pick wisely whether you want to keep that stream private, unlisted or public. This is me doing some late night testing for the blog. You can now share your URL with your audience and check out your statistics in real-time. There may be a delay of a few seconds - this is entirely normal and you can tweak lots of settings on the dashboard. By default the command-line we used won't be transmitting audio, for that we'd have to recompile ffmpeg using the Dockerfile and some additional options. In our entry.sh script we set an empty audio channel since YouTube requires us to stream some audio, even if it's empty. If you'd like to set your camera up on a window then there are two products I'd recommend which come with mini suction cups. If you'd like to learn more about Docker on the Raspberry Pi then head over to my free tutorial series as featured in Docker Weekly. There you'll be able to Build a Timelapse Rig with your Raspberry Pi, Create an Environmental Monitoring Dashboard, get started right at the beginning with a video and much more! Can I tweak the settings of the Dockerfile? This short Gist gives instructions for editing the Dockerfile and entry script. 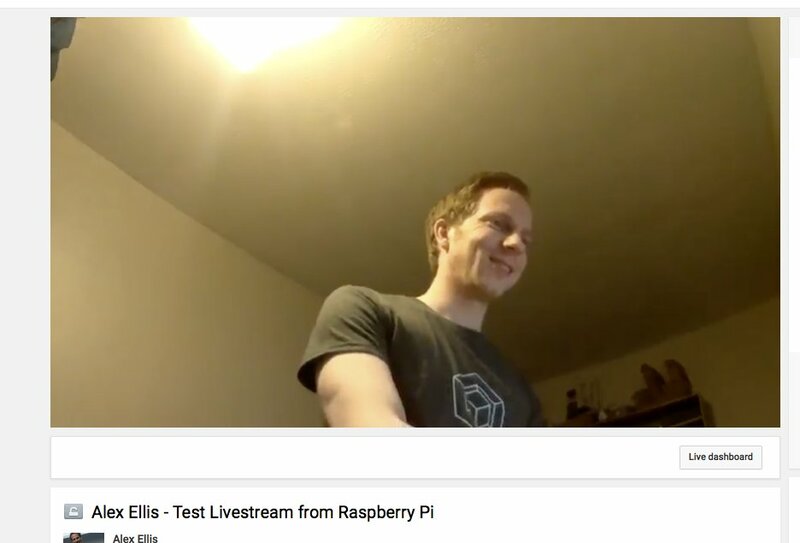 This tutorial is geared up to use the Raspberry Pi camera module. Live-streaming with USB cameras is possible but there are more variables involved depending on the camera. If you'd like to write your own tutorial using a Dockerfile for a USB camera I'll link to it. Isn't this faster to build on an RPi3? Yes it is (around 45-60 minutes including adding libraries) - but there is something brilliant about being able to use the tiny form-factor of the ZeroW which has WiFi built-in. Can't I cross-compile on another machine? It's hard to reproduce exactly the same result every time. Shouldn't there be a deb for this? There are several ways of packaging software including Debian package files, Docker images, binaries and source tarballs (tgz). The deb package would assume the target OS is Raspbian (only) - the Docker image we've built should technically run on non-Debian based distributions too such as ArchLinux. Debian packages also need a certain amount of vetting and community involvement to get into the official repositories. The Dockerfile is a quick and easy way to get a repeatable result.